Each is constructed of solid black wood with a matte finish. Don't leave your swords lying around collecting dust; display their individual uniqueness! Great for every collection! Assembly required. Good product, fit together easily. The piece that connects to the base is a little loose, but that'll easily be fixed with a two part epoxy. Nice stand, makes my ronin pro katana look even better. Its a good size but remember you got to take care of it, it might end up breaking. My experience was a little better than some of the others that reviewed it. The pieces fit together nicely. No perfect, but a little bit of Elmers glue acts like mortar to close any narrow gaps make the piece much stronger. 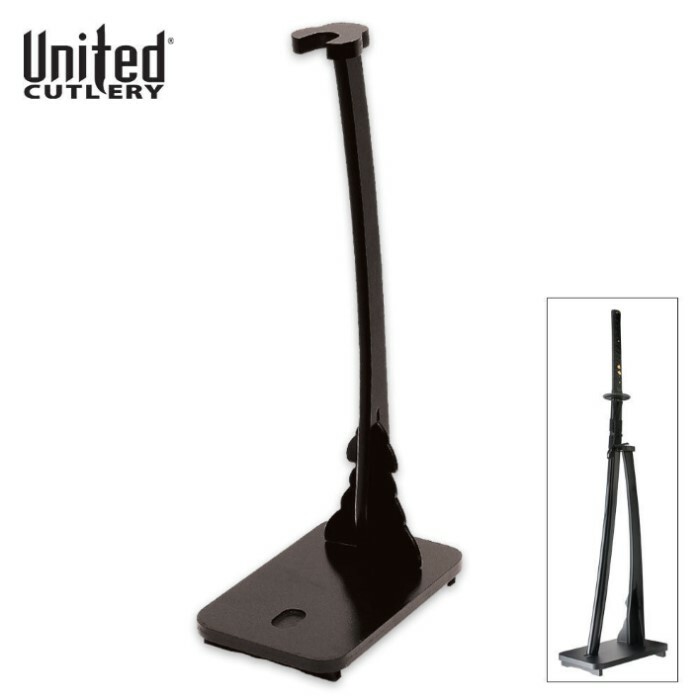 Works best with Katana and similar shape but whatever goes into it the heavier end has to go on the bottom, and the stand probably needs to go in a corner, which it probably would anyway. I've experimented with both Kit Rae Mithrodin and Elexdrow spear, look great but you have to be careful. I have had this stand for over a year now. It dose not stand the test of time well. Presd wood, bad lamenating. Realy just cheap in more ways than one lol. Its realy not a bad stand for what it is made for. Pick a sowrd you do not use, and just want to display and leve it on it. Do not use for your every day sowrd it will not tack the handling. A great sword stand. It comes in three pieces. It gives you a bit of a struggle putting the pieces in place; the top piece is especially tough. But once together it's a perfect one sword stand. A single katana stands stirdily in place and it looks good holding one of my katana. Every Sword lover and collector should have at least one of these. A ton heavier, sturdier and flashy than i thought it would be. I was expecting really delicate and easy to break wood. It was surprisingly strong and actually needed pressure to put it together! No screws, just wood pegs and holes to put them into- not as bad as it sounds. Really sturdy. I'm glad I ordered it- shows off my new sword great! pleased got it in mail same week of ordering but only disappointed that screws were too small & wood cracked lil' bit, but overall it held up my heavy broad sword with ease. looks great, supports my katana ... ok.. could ask for a better fit. the instructions said to place the saya(scabbard) up, which seems way to awkward to me. also when assembling the stand, the holes where the wooden pegs fit into didn't line up exactly. so the wood kinda split in the back.